Employee Recognition – What Makes a Good Reward? I would like to pass a long an article on “what makes a good reward”. Above all else, a good reward should reflect a genuine expression of appreciation. Token acknowledgements leave something to be desired. To endure a motivating influence, rewards should be aligned with the values, goals, and priorities that matter the most. The diverse workplace demands alternatives. Consider creative options to keep your program fresh. No single reward format works for everyone all the time. Some personal dimension is essential to a good reward. No matter how formal or informal, expensive or affordable, the relevance of any recognition will be improved with a personal touch–it’s a little thing that makes a big difference. It is important that rewards respond to the behavior they are intending to reinforce. Don’t let too much time pass or the reward will be devalued and credibility eroded. Finally, when announcing and presenting awards, take the time and effort to do it right. Doing so will enhance the credibility of the process, make an impression and unlock the emotional commitments that should continue to pay dividends long after the occasion has passed. Tangible rewards come in all shapes and sizes. Whether the cost is high or insignificant, the reward should be memorable and perceived as valuable to the recipient. Money is nice, but it tends to be spent quickly and then forgotten. 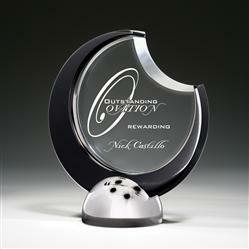 I believe that the best rewards are those that have a symbolic significance that fits within an organization’s culture. For instance, Trinity Services, a non-for-profit agency serving people with disabilities, has introduced a frog mascot, Lillie Leapit, into its culture which encourages employees to “leap ahead.” A variety of rewards, low in cost, but sporting a leaping frog, have been given for specific performances. “The employees have come to relate more enthusiastically to the frog logo than to the agency logo of three diamonds. Each time they see or use the item, it reminds them once again that they successfully took another giant leap.” Debbie Gustafson, Directory Employee Services, Trinity Services, Inc. Provided by someone of significance to the recipient. Provided impersonally or without a presentation at all. Bob Nelson, Nelson Motivation, Inc.
Have you caught anyone doing something right? Traditionally we tend to admonish and call out the mistakes made on the job or reprimand the problem employees – the “squeaky wheel getting the grease”, so to speak. All this, while the unsung heroes of your organizations, who are at the core of your organization’s accomplishments, go about their jobs, mostly unnoticed. I am sure many of us are guilty of this. We personally had been. One of the best kept secrets today is the power of recognizing employees. To be the most effective, the recognition or thank you should come as soon as possible after the achievement or desired activity. You also need to be specific about what you are praising the person for and why. Recognition and praising that are too broad tend to seem insincere. But saying “Thank you for the exceptional initiative you have shown in developing new business” or “Thank you for turning a potentially embarrassing and disappointing situation with a customer around with your willingness to help” specifically says what and why an employee’s effort was of value. Try “Recognizing the Everyday Greatness” around you – it will be appreciated and worth the effort. This entry was posted in Uncategorized on July 14, 2007 by admin. “What’s Hot” or new is a question we get asked frequently when working on new recognition requests and concepts…. … Design, Mixed Media and Color! Today’s customers want a creative blend of color, creativity and contour. 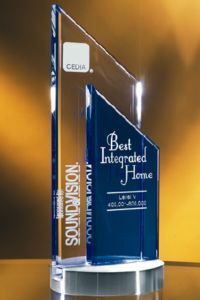 As a result, award designers and manufacturers are offering new unique products to satisfy this need. 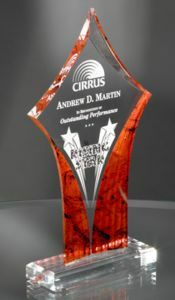 One increasingly popular way of addressing the requests are the use of more creative, attention-catching designs in acrylic, glass and crystal utilizing bevels, angles, contours, varying degrees of thicknesses, and other manufacturing techniques to create unique contemporary dramatic designs. The designs are enhanced by marrying various metals, resin, exotic woods or stone bases or highlights – combining and mixing mediums. 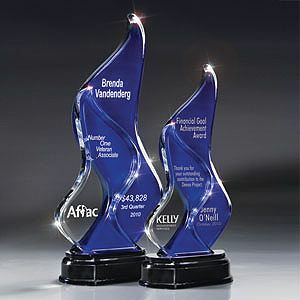 To further enhance these creative designs we’ve noticed trends in adding color to the designs such as hot-stamped digital images applied to the acrylic/glass/crystal designs and in some case four-color process images applied directly to acrylics. Both sides of the item can be customized to give imprinting a layered look. These new awards seem to approach the realm of art, with their creativity, design, different materials utilized and color. So when we are asked “What’s Hot” in Recognizing Everyday Greatness, our answer has been “Design, Mixed Media and Color”! Did you know what the oldest sporting trophy is that was first contested in 1851? 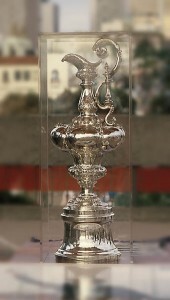 Answer: The America’s Cup, a Silver ewer (pitcher), presented for Yacht Racing. The Cup itself is an ornate silver-plated Britannia metal bottomless ewer, crafted in 1848 by Garrard & Co. The trophy is inscribed with names of the yachts that competed in the regatta’s matches. Bases matching the silver cup were added in 1958 and 2003 to accommodate more names. The cup is one of three or six that were made as off-the-shelf trophies. Sir Henry Paget, the Marquess of Anglesey bought one and donated it for the Royal Yacht Squadron’s 1851 Annual Regatta around the Isle of Wight. It was originally known by the Squadron as the “Royal Yacht Squadron Cup” or the “RYS Cup for One Hundred Sovereigns”. The Cup subsequently became known as the “One Hundred Guinea(s) Cup”, by the American syndicate that won it. As time went by, the Cup was also referred to as the “Queen’s Cup”, the “America Cup”, and the “America’s Cup”. Today, the trophy is officially known as the America’s Cup and affectionately called the “Auld Mug” by the sailing community. Volunteer turning Sandy Hook Lightship on Sept. 27, 1887 during the seventh America’s Cup.The surviving members of the syndicate which owned the America donated the Cup through a Deed of Gift (written in 1852) to the New York Yacht Club on July 8, 1857. The trophy would be held in trust as a “challenge” trophy to promote friendly competition among nations. Stung by this blow to contemporary perceptions of invincible British sea power, a succession of British syndicates attempted to win back the cup, but the New York Yacht Club remained unbeaten for 25 challenges over 113 years, the longest winning streak in the history of sport. Matches were held in the vicinity of New York City from 1870 and 1920, which includes the “Herreshoff Period” between 1893 and 1920, when cup defenders were designed by Nathanael Herreshoff. From 1930 to 1983, the races were sailed off Newport, Rhode Island for the rest of the NYYC’s reign. On Tuesday afternoon in March of this year, Alinghi successfully defended the 32nd America’s Cup for the Société Nautique de Genève with a thrilling one second win in Race Seven over Emirates Team New Zealand. Alinghi wins the 32nd America’s Cup Match by a 5-2 score. The protocols for the 33rd Americas Cup were released on July 5, 2007. The protocol agreed to with Club Náutico Español de Vela, the Challenger of Record, will feature boats of 90 feet in length and crews of up to 20. Final specifications and the host city for the 33rd Americas Cup will be released no later then 31 December 2007. The 33rd Americas Cup will take place no earlier then 2009 and no later then 2011. This entry was posted in Uncategorized on July 7, 2007 by admin.